Many of you may remember last year's exciting finish when Cristie Kerr birdied the 11th, 13th, 14th, and 15th holes in route to a 3 stroke victory over 3 players. Kerr's score of -20 under par 268, set a new tournament record. Her third round score of 62 was also a tournament record. Cristie Kerr celebrates after her 2017 Lotte victory. This will be tournament #8 of 33 on this year's LPGA schedule. My strength of field rating is 59% (down from 64% last year). 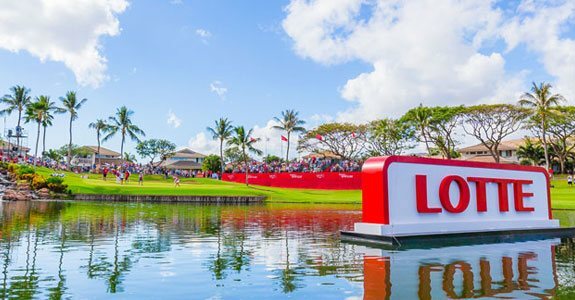 Thirty of the top fifty players from the LPGA Priority List, and 27 of the top 50 players from the Rolex Rankings will be in attendance this week. Those absent this week include: Lexi Thompson, I.K. Kim, Jessica and Nelly Korda, Amy Yang, Stacy Lewis, Mirim Lee, and Brittany Lincicome. 1- Shanshan Feng - World's number #1 player is always a threat. 2- Inbee Park - Could take over top spot with a victory. 3- Sung Hyun Park - Due for a good showing. 1- In Gee Chun - Has slipped to #12 in the rankings. She is better than that. 2- Jin Young Ko - Will add to an already solid season. 3- Michelle Wie - Will want to win in Hawaii. 1- Angel Yin - Has to break out of season long slump. 3- Aditi Ashok - Just a hunch. What player finished in the runner-up position in each of the past two years, in spite of shooting a combined total of -32 under par? UPDATE #1 - Min Lee and Julieta Granada are the Monday qualifiers.